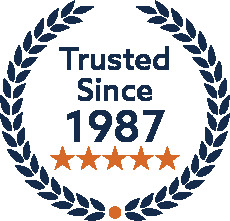 These replacement Center Consoles are manufactured to factory specifications and workmanship. Customizing your interior or getting it back to factory standards has never been easier. 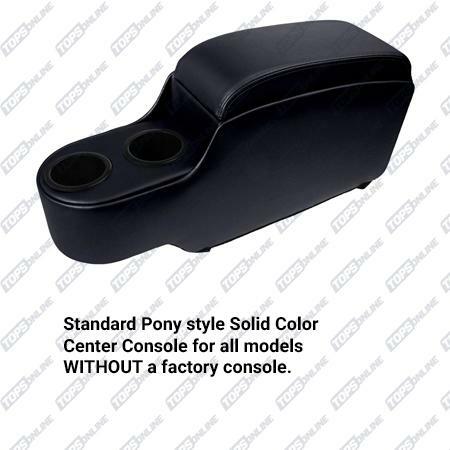 These replacement Center Consoles are for the 1970 Coupe, Convertible and Sportsroof models. These Center Consoles fit in between your two front bucket seats and have two standard size cup holders. Consoles are manufactured with a French seam, hidden hinge, and a pocket underneath the padded armrest. These will only fit models WITHOUT a factory console. So, please choose your model accordingly. 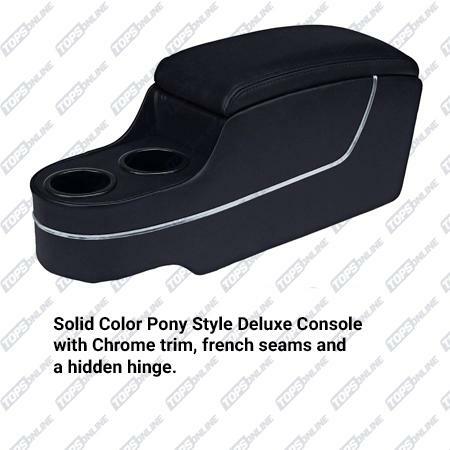 Dimensions: Length: 21.25" , Width at rear: 6" , Width at front: 6" , Height at highest point: 7"
Center Consoles are offered 2 styles: All one color Corinthian Grain Vinyl, or in two colors (Two Tone) of Sierra Grain Vinyl, with the insert under the arm rest pad being the second color. The Black and Red Two Tone in the table below is just one example of the two tone combination. When you place your order, let us know which two colors you would like, and we will make it for you. These Deluxe Center Consoles fit in between your two front bucket seats and have two standard size cup holders. Deluxe Consoles are manufactured with a French seam, hidden hinge, chrome trim that wraps around the console, and a pocket underneath the padded armrest.